The Google Play Store is golden mine providing access to countless android applications, for every purpose that you could possibly think of. Ranging from productivity, media, social networking, editing, learning, the Google play store is a bounty of all Android applications, but we decided to look outside this box. There are infinite android applications developed almost every day. Many of the best from the lot doesn't even get released on the Google Play Store due to copyright infringement or other terms and conditions violations. 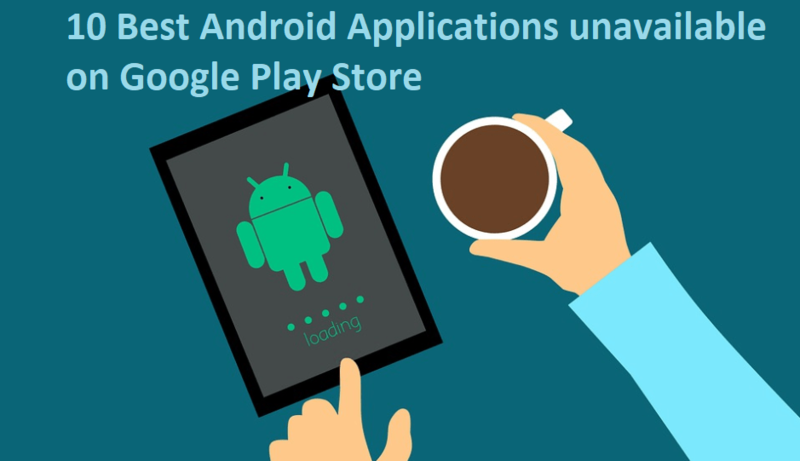 So we are going to list out the 10 best applications for your android device, that you can find outside Google Play Store. Note: Before you download of these mentioned applications from a third-party source, ensure the website is a trusted source. This would minimize your chances of a downloading of a virus. Annoying and irrelevant advertisements could get in the way of your browsing experience. These adds which fill up the screen before you could close them gets very annoying really soon. AdSkip is the best applications to block irritating adds. This app runs well while using apps like Xtunes etc. Another great application to block annoying adds is AdAway. It works well as the AdSkip application. It removes adds from every possible application downloaded on your phone. To use this application you would require rooting your android device. This application can be handy when you wish to download music, audio, wallpapers, quickly from your Android device. You could also link the media to your websites, blogs etc by using this application. Just like the name rings a bell of fresh popcorn to enjoy a fresh movie, this application lets you do the same on your android device! It comes with a brilliant catalog to choose from. One doesn't need to torrent anything anymore and has good quality playback. This application is bug-free and you could watch trailers before playing any movie. The application highlighted by the BusinessInsider is free to use. Music enthusiasts can commonly come to a mutual understanding of the importance of equalizers. This application is the ultimate in performance when compared to other equalizer applications. This application works only on a rooted android device. Once installed, you could perform speaker optimization, fidelity control etc. This wonder application isn't available on Google Play Store due to policy regulations. But that doesn't stop you from accessing this useful app. This application lets you download almost any video from Youtube, DailyMotion, Vimeo etc straight into your android device. Download audio tracks of the video are also one of the facilities that come with this app. You can view lyrics of audio tracks and music files. You can also download the lyrics or save it offline to view later. The application uniquely refreshes to bring to you lyrics of songs you add to your device every time. is a version of Chinese Spotify app and lets you download lyrics and songs. What's more is that it's completely free of cost, and you don't need any subscription to the service, to begin with. The cloud stream application will allow you to download the tracks to your device directly. This is a file manager that allows you to multitask and manage applications with ease, speed, and technology. This works well with google cloud and comes with a neat interface. It is free to use and can be customized to any color as you like. Your device need not be rooted to use this explorer. Last but not the least, this application is handy for every user who needs torrents regularly. Searching for torrents can be a cumbersome process, with multiple options to choose from, which aren't even updated regularly. The advantage of using this is, that you get to filter your results by the number of leechers, seeders, and shows you results from the major websites. This application is recommended for easy access to torrents with a tap on the screen! These applications will add more convenience to your daily use of Android devices, and you'll make the best use of these android applications!